How can we learn more effectively from what each of us is doing in our classrooms? Here is a video version of this post – why I’ve done this will become clearer as you watch or read along. Where was I? Ah yes. I work on initial teacher training courses most of the time and we get, for the most part, very positive feedback from course participants at the end. Interestingly, the thing that consistently receives almost unequivocal positive feedback is observing us (the tutors) teaching the same students that the trainees are working with. So as a teacher trainer I am drawn inexorably to the conclusion that the single most powerful tool for initial teacher development is witnessing someone – maybe a more competent other – who essentially shows you the ropes. What if I have no one to play with? I’ll wash my mouth out with carbolic soap later, but for now, humour me. With the widespread availability of mobile devices with advanced recording features, it is much more feasible to capture lessons (either snippets, longer segments or even whole events) than it ever was in the past. What are we afraid of? Is it fear that we will be outed as bad teachers? Ours is a very self-critical profession, perhaps an overly critical one. However, I have yet to watch a teacher at work in whose practice I haven’t easily found something admirable. I have yet to be watched by someone who ripped me and my work to pieces. I repeat: what are we afraid of? Is it fear that what we really do in the classroom – even if it is “good work”, won’t live up to the image that we have projected to others? 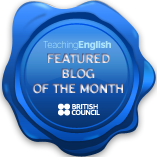 I certainly feel the pressure of this one; despite the title of this blog and my interest in unplugged teaching, I am sure that some observers would be nonplussed to see me at work on a one-off occasion – “where is the ‘unplugged’ bit?” I may hear them cry. So what? The room belongs to me and my trainees – our classroom, our rules. Take it or leave it – but if you take it, take it on its own terms. At the risk of repeating myself: what are we afraid of? Is it fear that we will appear un-photogenic? Watch the results seven times before asking someone else to watch it, and you will get over that, guaranteed. you comment and send me a link to a video from your classroom. Interested in using the TDSIG Unplugged Conference to set something like this up? Form a working group on the day and get cracking! Not remotely interested in this? Fine, then form a working group on something else! Yes I’m afraid! VERY afraid, because I have this notion that I’m a bit of a rubbish teacher. I’m serious. I “teach” students for like a week or two at most. That is not time enough for them to rumble me. I am a superb blagger and I keep my trainers on ALL THE TIME. (lions and cameramen abound! )My teaching is not based on any theory, or methodology, or principled-ly eclectic anything. I just do it and there’s an end to it. I “teach” in a place that focusses entirely on speaking and listening. Writing happens sporadically and there’s very little reading (certainly none in class). It’s a place where face to face talking happens, where noticing and asking and listening and opining and suggesting and soap-boxing and empathising and old-fashioned “hard teaching” happen. If I was filmed? I have no idea WHAT the upshot would be. Seriously, I’m afraid too – that’s why I wrote the post. I am fascinated by the openness with which teaching gets talked about and the overwhelmingly generous reception that such openness meets, but that so many of us are still deeply insecure about really sharing what we really do “behind closed doors” – and what we “really do” is exactly what you describe in your comment so well: we do our best. So I think – however hard it may be for me – I need to feel the fear and do it anyway (remember that old classic?) How’s this: I don’t do much front-line teaching these days, but I’ll try to capture some footage of me “in the wild” some point over the next few months and put it somewhere you can see it; I’d like you to watch it and tell me your responses, because I value your opinion and am prepared to trust your judgement. Don’t feel you have to follow suit if you agree to help me on this – you would be doing me the favour! If you use a “theatre” anology you won’t have to “wash your mouth out with soap” for using the word “tech”. When a theatre production is filmed and aired on television so that people can see it all around the world, it does not become a TV show or series. It is still a play. On the other hand, the camera IS a scary tool and influences everyones behavior – takes guts to film your lesson! It is interesting, though (changing tack a bit), how some people feel recording produces something fundamentally different from the live event: in classical music, for example, Sergiu Celibidache was notorious for insisting that recordings were not “music” in any real sense! And you are right, the introduction of an “all-seeing eye” does influence the whole – but what fascinates me is: why is it scary? What are we afraid of? And, crucially, how can we get over these fears if (as I do here) assume that the products would be worthwhile having? Look forward to “being in your class”! I can’t see why I would not do it! That’s the spirit! Now I have some willing accomplices, I really should get the camera out! Great stuff, Anthony! Now, we shall look forward to you & the rest on video! Yeah, but the people who are interested enough to discuss this with you are very supportive!!! That being said, I’m not offering anything. That sounds fascinating! I’m looking forward to reading into your blog next week when life gets back to normal here. I am very grateful for having met so many positive and supportive people in the last year, though, both face to face and online. There really is such a thing as a community of practice! I always enjoy a good video post – and this was a good video post. 🙂 We need more of the in the blogosphere. For me (in terms of video posts on my blog), the biggest question/fear before taking the plunge was ‘will anybody actually bother to watch it?’ Now, I could record one quite happily should the need arise. As for recording classes, the ‘my school won’t allow it’ line would be a geniune barrier to be overcome as I work with kids and the powers that be/parents are a bit funny about recording their little darlings, especially if it is to be posted somewhere online. However, this is I barrier I intend to oversome especially with my MA thesis and the need for in-class research looming. One suggestion that was made when discussing video observation in the teacher training module I did on my MA recently was the need for a few ‘practice runs’ before the recording programme starts with the camera visible in class (whether recording or not) thus allowing students and teacher alike to get used to it. That could help people overcome their ‘stage fright’ as well. I must admit, I’m not crazy about sharing a video of me in the classroom with the entire world either: but of course it needn’t start that big. And I agree that there are certainly plenty of situations where videoing classes is genuinely difficult to the point of impossible (as you say). But I know that in my context, at least, I could get it done if I really tried – and JAson Renshaw has shown in his video how to make good use even of a video where the only one visible is the teacher! Heh heh! I know and have actually changed it – but the video seems determined to embarrass me and is clinging on to its original form!